Tsushima leopard cat is the subspecies of Amur cats, and it is classified as the most highest class of critically endangered animals. Although the protection activity is highly recognized, the number of animals is decreasing due to the human activity and invasion of domestic cats and infectious disease. In this study, we succeeded primary culture of normal fibroblasts derived from the Tsushima leopard cat (Prionailurus bengalensis euptilurus). Furthermore, we introduced the human derived mutant Cyclin Dependent Kinase 4, Cyclin D1, and telomere reverse transcriptase. We showed that the expression of these three genes efficiently immortalized cells derived from Tsushima leopard cat. Furthermore, we showed that the chromosome pattern of the established cells is identical with the original one. 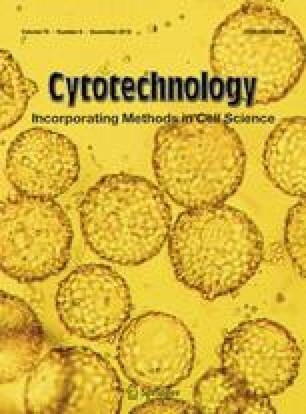 These data indicate that our method of immortalization is useful to establish cell lines from critically endangered cats, which potentially contributes to the re-generation of critically endangered animals from cultured cell with reproductive technique, such as somatic cloning. We thank Dr. Hiroyuki Miyoshi (RIKEN, BioResource Center) for providing lentiviral constructs. This work was supported by the Grant from JSPS, KAKENHI, Grant Number 17H03624.